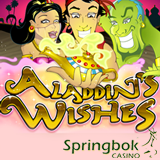 South Africa’s Springbok Casino wants us to try their Aladdin’s Wishes and they'll give us a casino bonus up to R2500 and 50 free spins if we do. We can get these bonuses whether we play on our computers, phones or tablets. Aladdin’s Wishes is a magical Arabian fairy-tale-themed game with a Free Spins bonus feature. The five reel, 20 payline game features a beautiful Princess, a big green Genie and a Magic Carpet spinning on its reels. Magic Lamps trigger the bonus feature where players choose lamps that reveal prizes -- up to 25 free spins or an up to 100x bet multiplier. Everyone that plays Aladdin’s Wishes in February will earn Comp Points, which can be redeemed for cash, twice as fast as usual. Springbok Casino players normally earn 1 Comp Point for every R10 wagered. This month, while playing Aladdin’s Wishes, they’ll get 1 Comp Point for only five Rands in wagers. Springbok Casino caters to South African online casino players, offering hundreds of games from RTG. 23 games are available in the mobile casino.